Benjamin Bonenfant and Judith-Marie Bergan in “Great Expectations”. OSF photo. Sadly, spectacular acting cannot overcome a flawed script, and this world premiere adaption of Dickens’ Victorian masterpiece novel feels more like a well done intellectual exercise instead of engrossing theater. Adapters have to be ruthless. They have to identify what can be communicated in the new medium and then transform the storytelling to work on stage. No doubt that beautiful plots and characters present in a 500+ page book each enrich the written tale. But, on stage too much textual exposition is a mismatch. Instead of adding to the evening, narration distances the audience from the characters and action. 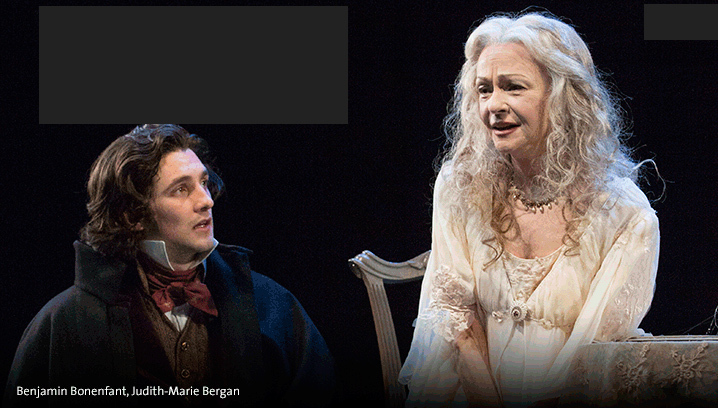 OSF’s Great Expectations fails to adapt and instead remains tied to the use of rich language and verbal exposition. The “play” uses an onstage chorus to narrate most of the arc of maturation of the hero Pip. The narrators do more than bridge the time, they state changes in the characters’ world view and manner of interacting with each other. We are told rather than shown what people are doing, thinking, and feeling. More than anything, Great Expectations feels like a reading rather than a performance. Great gobs of change are revealed in paragraphs of onstage narration. The chorus stops. Characters come on in front of the audience and deliver a vignette that validates what the chorus just told us. The actors scurry off stage, and the chorus comes back on to speak to us about what happens next. It’s impossible to get involved in the lives of the people we are meeting. The set doesn’t help bring us into the world on stage. Pushed back from the audience, there is very, very, very little scenery on the stage. Instead there is a ever-present backdrop of dark slats with barren dark runways and steps for the actors to walk around. The look is modern art and metallic — I thought of a Ruth Asawa sculpture forced to serve as scenery. There is nothing Victorian, Dickinson, or engaging about what we see. The costumes also were spotty. Designer Deb Dryden did a fine job putting the actors in classic Dickens-story clothes. They were appropriately and unobtrusively Victorian. But, I was distracted by the director’s decision to have the endlessly reappearing chorus show up in the same Christmas-green Victorian robes that made me think that they were going to burst out caroling at any moment. Some variety or a less seasonal color would have been better. The performance’s best moments are the opening scenes with Derrick Lee Weeden (Magwitch) and child actor Bodhi Johnson (young Pip). The violence, terror, anxiousness, and humanity at the first moments are great theater. Real, frightening, and emotionally genuine. But, then the chorus starts up and we never regain the immersion in the onstage action. Early on we almost get back as young Pip, his stepfather Joe (played by Al Espinosa), and Magwitch act out the first plot line superbly. But, the acting is quickly inundated and overwhelmed by the narration. The story is told to us, we enjoy it, but we never re-enter its world. The believably of the onstage action is not helped by the comic overacting that appears at odd moments without reason. After the real, gripping fright of the scenes between Magwitch and Pip, Mrs. Joe (played by Amy Newman) comes on stage and offers a caricature of an abusive adoptive parent. Her viciousness is not funny. Her actions intensify the trauma suffered by Pip. So, why is it overacted to the point of giggles? The lack of engagement aside, the performance is not painful. The story is interesting, it’s clear, and the actors deliver their lines sharply. Michael Elich as Mr. Jaggers, Judith-Marie Bergan as Miss Havisham (I saw in the opening night performance before illness forced her offstage and Caroline Shaffer assumed the role) and Richard Howard as Wemmick are particularly strong. You’ll survive Great Expectations, but your conversation home will be filled with suggestions on how the adapters should have done things differently.